Dr. Poornima Ramakrishna is a Gynecologist and Obstetrician in Jayanagar 5th block Apollo Cradle, Bangalore and has an experience of 17 years in these fields. 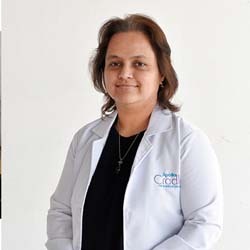 Dr. Poornima Ramakrishna completed MBBS from Bangalore Medical College and Research Institute, Bangalore in 2000 and MS – Obstetrics & Gynaecology from Lokmanya Tilak Municipal Medical College, Sion,Mumbai in 2002. high-risk delivers and gynec procedures. I was admitted to Apollo Cradle, Jayanagar for my delivery under the care of Dr Poornima. The hospital is clean and hygienic. Dr Poornima is professional and highly qualified. The nurses are diligent and ensured all my needs were catered to. I was given proper attention at all times. The administration staff was responsive as well. Thank you for the quality services Apollo Cradle. Thank you Dr. Poornima for good support given to me during my pregnancy and delivery classes, Yoga classes also helped me a lot; Thank you Cradle staff.